As acknowledged in every history of modern Paganism, the articles, poetry, art, and letters published in Green Egg over the past four decades informed, inspired, and shaped the emerging Pagan community into the fastest-growing religious movement in the English-speaking world. This richly illustrated anthology of favorite writings and artwork from those legendary issues opens a window into the birth, infancy, and adolescence of a transformative cultural revolution that is now, in the 21st century, entering its maturity. Selections from 40 years of Green Egg include articles from numerous contributors, including Antero Ali, Isaac Bonewits, Marion Zimmer Bradley, Darryl Cherny, Phyllis Curott, LaSara Firefox, Ed Fitch, Jesse Wolf Hardin, Anodea Judith, Ralph Metzner, Diana Paxson, Starhawk, and Robert Anton Wilson. Experience the magick, the mystery, the humor and the history as it first appeared—in the pages of the Green Egg! Oberon Zell-Ravenheart is the author of Grimoire for the Apprentice Wizard, Companion for the Apprentice Wizard, and A Wizard’s Bestiary. A respected leader and Elder in the worldwide magickal community and an initiate in several different Traditions, he has created and participated in many Pagan and interfaith groups and projects, playing a major role in reclaiming the spiritual heritage of pre-Christian Europe. As publisher of the award-winning magazine Green Egg, Oberon was the first to adopt the words “Pagan” and “Neo-Pagan” to describe the newly emerging Nature religions of the 1960s. 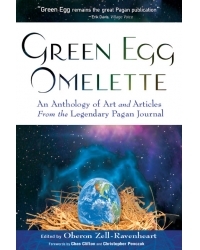 Since 1968, Green Egg has served as a primary catalyst and journal for the entire Pagan community. Oberon resides in Sonoma County, California, with Morning Glory, his beloved wife of 35 years.